"Improving your Business Intelligence through Management Systems"
This workshop is based around the latest international thinking and information from our colleagues on the various standards committees and certification bodies. How will Annex SL help? Can there be a way forward to integration with these new standards? We will deal with the Context, Leadership, Risks and Opportunities, Objectives, and Organisational Knowledge aspects as a priority. This workshop is intended for Managers, Auditors, and Business Mentors. It will be a good opportunity to have clients, potential clients, and auditors mixing with no hard selling. 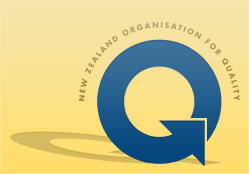 Note: This workshop qualifies for 8 CPD hours for the NZOQ Certified Quality Practitioner (CQP), Certified Quality Manager (CQM), and Certified Quality Internal Auditor (CQIA) professional development programmes. Learn about how the ISO standards will add value to your business, the perceived issues in implementation, and how the management processes will be evaluated. The ISO Standards Knowledge workshop is a highly-interactive one-day workshop around the new ISO Standards of Quality (9001:2015) and Environment (14001:2015), which commence being introduced later this year. The new Health and Safety Standard (45001:2016) has a similar structure. All attendees, having finished the workshop, will have a sound understanding of the interdependent relationships between "quality management" and risk management for product, service, staff, and end user. It is not just a workshop for those seeking certification—it's intended for any business that wants to add value to their day-to-day operations. While the formal roadshow has been completed with over 50 registrants at 8 locations future workshop opportunities will also be considered, subject to demand. Corporate (in-house) workshops can also be arranged, subject to availability.